It was a school holidays in the late 80’s, and the junior hornets, then run by the legendary Ann Swanson, were on a day trip to Highbury. I was on the trip and we’d enjoyed a tour of the stadium, hearing the horse and cart ghost story, and a game of football in the JVC centre – an indoor sports hall in the depths of Highbury. After a great day we all piled back onto the Watford branded double decker bus and headed home in high spirits. There may have been a chant or two. We were joined by a few of the youth team players at the time – David James was one from memory – and I was sat on the top deck about 6-7 rows from the front on the top deck. How could a football filled day like this go wrong? (this is feeling like a set up in an episode of Casualty). As we went past, what I remember to be, Finsbury Park train station we went under a railway bridge. 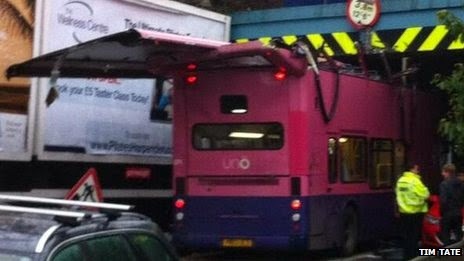 It was no ordinary bridge, it was a bridge that was a fraction lower than the height of our bus. There was a sound of very loud crunching and scrapping as the metal roof opened as easily as the foil on a sandwiches I’d devoured earlier that day. A shout of “GET DOWN! 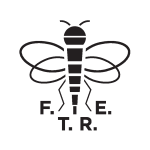 !” was bellowed by David James, and we all ducked. The roof of the first 2-3 rows were concertina back. All were checked and found to be okay. We got off, waited at the side of the road before being taken to a near by police station. There we waited. No mobile phones to call home or tweet a picture of the bus, but all were happy and we got to see the police cells. Our behaviour must have been good as no one was left behind at the station. 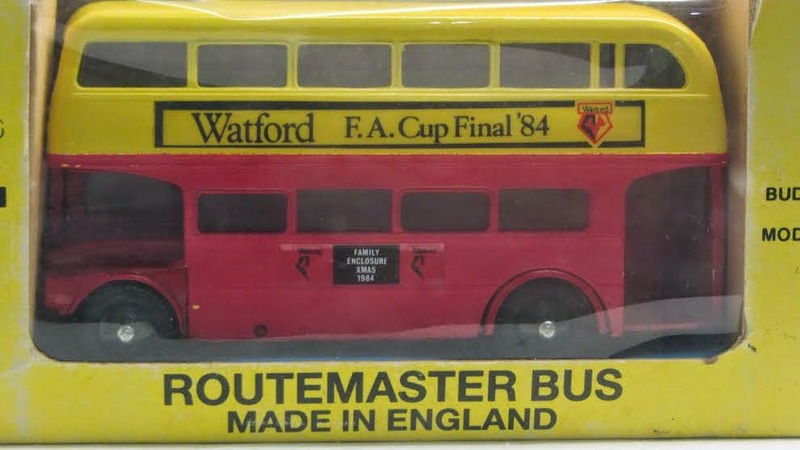 After talking about this object on the podcast, Ralph Buckland send us an email with a picture of a toy Routemaster bus, with Watford FA Cup Final ’84 branding, that he owns, which is currently on loan at the Heritage Motor Centre in Gaydon Warwickshire. As you can see it’s roof is in good nick!So object 45 in our list of 100 Objects that define Watford Football Club is a Watford Branded Bus, no matter how big or small.